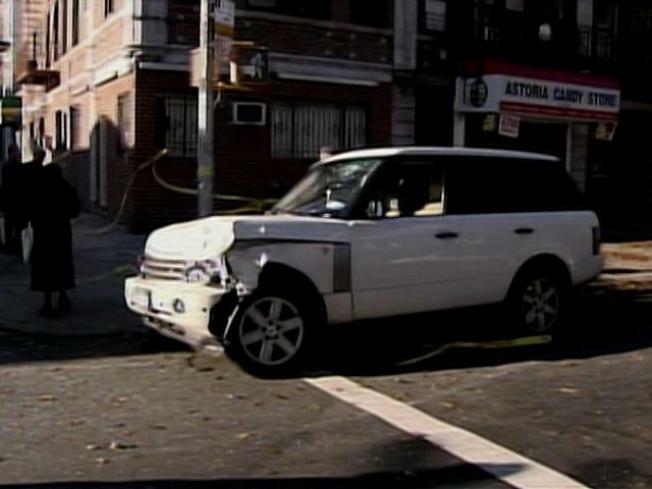 A 23-year-old driver behind the wheel of this white Range Rover was arrested under suspicion of drunken driving after he plowed into a livery cab, killing the two women inside, early Sunday. A man suspected in the beating death of a financial worker in Manhattan in 2006 now faces charges of vehicular manslaughter and drunken driving in a crash that killed a livery cab driver and her passenger in Queens, police said. The women were killed after a Range Rover slammed their livery cab around 3 a.m. Sunday near 34th Street and 31st Avenue in Astoria. The driver of the SUV, Daryush Omar, 23, of Plainview, Long Island, was arrested under suspicion of drunken driving, police said. The cab had previously dropped off two other passengers, a couple, who were not injured. Police said the victims were Bessy Velasquez, 41, a driver for Myrtle Car Service in Brooklyn, and a passenger, Panayiota Demetriou, 30. The New York Times reports she is a Cypriot immigrant who worked as a psychologist in the emergency room of a Brooklyn hospital. The women were pronounced dead at Astoria General Hospital. The deaths come two years after Mr. Omar became a suspect in the robbery and killing of the financial worker. Omar was already slated to appear in Manhattan Criminal Court on Dec. 12, to face second-degree murder charges and first-degree robbery charges in the May 2006 beating death of Thomas Whitney Jr. of Hoboken, N.J. According to Newsday Whitney, 24, an analyst for Prudential, approached Omar outside a club in Manhattan to ask for directions to another club. Omar, who was on his cell phone, became incensed. Whitney was kicked to the ground and his wallet stolen, Newsday reported. He died from a crushed skull.